Editor's note: The student profiled below prefers her name written in all lowercase letters. 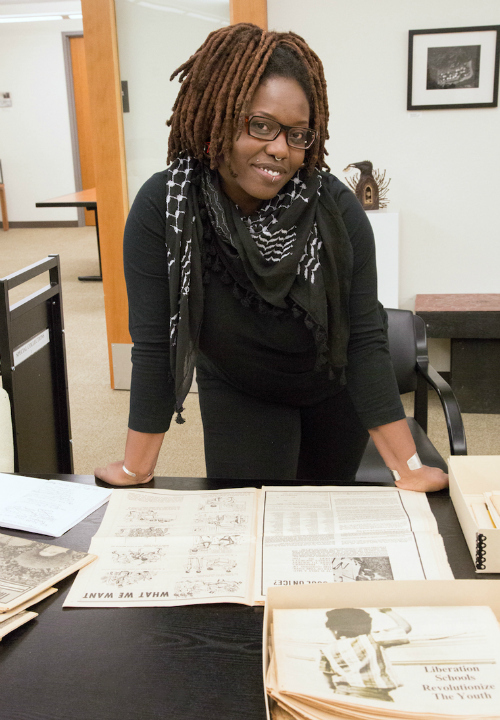 Graduate student crystal am nelson was one of the first people to get a close look at the stunning work of renowned photographers Pirkle Jones and Ruth-Marion Baruch that is part of Special Collections in McHenry Library. The black-and-white prints include powerful images of the 1960s, including portraits of Black Panthers, rallies, protests, and street scenes. "The collection was sitting in Special Collections. No one had gone through it," recalled nelson, a doctoral student in the History of Art and Visual Culture program. "It was exciting." In 2014, nelson got her white-gloved hands on the images as a participant in the library's Center for Archival Research and Training (CART), a program that supports graduate students who want to learn about archival research; students work closely with a professional archivist for one quarter to process and describe a collection related to their research interests. An aspiring exhibition curator, the program was a perfect fit for nelson, a photographer with a master's in fine art from the San Francisco Art Institute who is interested in contemporary representations of African American women. "At the art institute, we talked about Pirkle Jones all the time," said nelson. Discovering Baruch's work was eye-opening. The two photographers, who met at the art institute and later married, were contemporaries of such luminaries as Ansel Adams, Edward Weston, and Dorothea Lange. "Photography as fine art started in this region—San Francisco to Monterey—and there's a lot of the history of photography represented in this collection." The CART fellowship paid double dividends: nelson learned about archival work, and the project aligned nicely with her research interests. "I got to learn all that goes into processing a collection, from caring for it to the power of the archivist to shape the experiences of researchers and visitors," said nelson. "I saw the range of their interests from the 1930s, when he first started, through the 1970s and '80s. I got to look at his finished photos and also see his process." Jones favored abstraction, buildings, and nature, while Baruch consistently photographed women and children. As part of the fellowship, nelson selected images for inclusion in a 2015 "Activism in the Archives" exhibit at McHenry and online. She focused on a collaboration between the photographers and the Black Panthers in 1968, selecting several of Baruch's images of women and children. "The dominant narrative about the Black Panther Party focuses on the men—images of young men in leather jackets, black berets, guns," said nelson. "Ruth-Marion took a lot of photos of women who weren't in the party attending rallies and events. It's amazing to see this coterie of women who were part of the larger community. It's classical portraiture, not ethnographic. They are stunning. "There's the dominant narrative, but all these other things that were happening are important to the story," said nelson. "As a CART fellow, doing background research, I learned the bigger story." The exhibit also played a part in opening the door for the highest-value gift in campus history: The Pirkle Jones and Ruth-Marion Baruch Photography Collection. Jones had a deep affection for UC Santa Cruz; he and Adams spent many hours together photographing the campus in the late 1960s. In 2010, Jones donated the hand-curated collection of more than 2,600 photographs that nelson processed. That gift included his personal papers, as well as photographs by Baruch and about 150 Ansel Adams prints. Thanks to nelson, that collection is now available and accessible to scholars and the public. But that was only a portion of the photographers' vast archives. A generation of UC Santa Cruz librarians, archivists and campus leaders had kept in touch with Jones and, after his death in 2009, representatives of his estate. The Marin Community Foundation held the archives and last fall began seeking a new home for the collection. Elisabeth Remak-Honnef, head of Special Collections & Archives, invited Jennifer McFarland, executor of the Jones estate, to attend the Spring 2015 opening of the library's activism exhibit. When she saw it, McFarland encouraged the campus to compete for the entirety of the collection. Other universities and institutions were interested, but UC Santa Cruz prevailed. Receiving the gift was like "coming full circle" because of Jones' long history with the campus, said Remak-Honnef. Processing of the new materials—a major undertaking—will begin promptly thanks to a generous donation from Mark Headley, Remak-Honnef said. "It's a tremendous resource for anyone interested in Bay Area or California history, social justice, ecology and environmental issues," she said. Already, the campus has loaned prints to the Oakland Museum of California for their exhibit on the 50th anniversary of the Black Panthers. nelson has continued working with the Jones-Baruch images, co-curating another exhibit this fall to commemorate the Black Panthers. She, too, raves about the contents, mentioning "Death of a Valley," a 1956 collaboration between Jones and Dorothea Lange that documented the loss of the Napa Valley community of Berryessa Valley to make way for a dam. The photos tell a story of displacement, environmental destruction, agricultural expansion, water rights, and more—themes that would likely resonate with UC Santa Cruz students, she noted. "How do we get more students to use Special Collections?" she asked. "We have those photos. It's a gold mine."